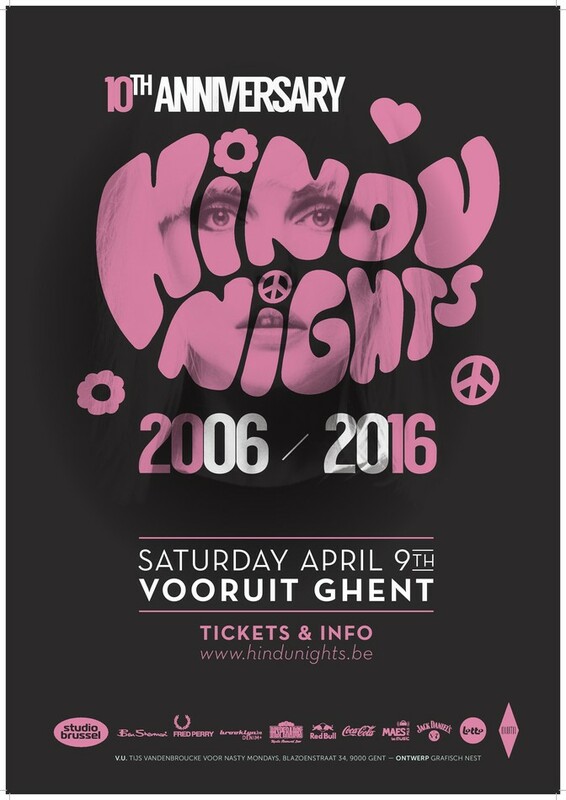 HiNDU NiGHTS will celebrate their 10th anniversary on Saturday, April 9th at Vooruit in Ghent. A decade full of‘Peace & Love’and ‘Rock ‘n Roll euphoria’ on the dance-floor! Peter Verbeke started the famous HiNDU NiGHTS in the Make Up Club in 2006. The period 2000 – 2005 was an exciting time for music. Peter experienced those days from a front row seat in London. Each year a lot of fantastic albums were released and London was once again the epicenter of Rock ‘n Roll (just like in the Sixties and the early Nineties). 2006 was an exceptional year as well with an outstanding Top 50 of albums in NME amongst which Arctic Monkeys, Kasabian, Amy Winehouse, The Rapture, The Secret Machines, Morrissey, The Kooks and many others. Upon his return to Belgium, Peter could do nothing else but create a platform for this music over here. It soon became clear that also here, a new generation of youngsters was more than ready to embrace ‘all things Rock ’n Roll’. This was proven by the time after time sold out HiNDU NiGHTS parties which were not only held in hometown Ghent but also ventured to cities as Antwerp and Leuven and festivals as the Lokerse Feesten. Since then music has changed quite a lot but HiNDU NiGHTS remains true to its original formula with ever growing success. Next to the establbished names, HiNDU NiGHTS also finds it important to give young bands the chance to profile themselves in front of a big crowd. So for this 10 year extravaganza, the doors will be opening at 22h00 and a few live bands that did well in ‘De Nieuwe Lichting’on Studio Brussels will be celebrating the 10th birthday with us. More bands and DJs will be announced soon but we urge you to get your tickets soon because this time, we will smash it big time: Anniversary Style! And, in good tradition, we will be filtering the good music from the overwhelming amount of shite tunes. Because, even after 10 years, Hindu Nights remains thé party where everybody sings along out loud and dances extravagantly, resulting in an extremely outrageous atmosphere, usually only found in British stadia and concert-halls.